The ground-breaking first meeting of the new Flagler ARES® organization is tonight at the Flagler county EOC. Emergency Services staff, and perhaps even Emergency Management Chief Troy Harper are expected to attend, as they are excited about having the ARES® resource back in the county. Local emcomm group members are also expected. Agenda items include a review of the new ARES® Code of Conduct, and training. Interviewing of EC candidates has been slow. East Coast DEC Michael Lee, WB6RTH, said "the new EC will have to be strong-willed, fearless and with a bias toward action, not just empty talk. We don't need a chair-warmer for an EC, but a team builder, a change agent, a customer and volunteer-focused individual who will lead in positive change. Being a prior EC has no bearing on this decision - only a passion for service and a service-oriented attitude will be considered." Flagler County ARES® has installed a new ICOM ID-880H D-STAR radio in the EOC's Radio Room. ARES® volunteers also revamped the Radio Room: All radios and power supplies were re-rigged with PowerPole connectors; antennas and feed lines were re-worked; and general clean-up was done. Eddie Cail, KJ4LRB, Phil McElrath, K5BBC, and Charlie Kunz, AA5QJ, joined with other EOC volunteers and staff members Frank Sanita, AA4FS, Bob Pickering, KB4RSY, and Harper for the work party. In the end, both Pickering and Harper were impressed with the efficiency and quality of the work. All work was documented and sent to EOC staff and management as a baseline for future perfor­mance measurements. Our neighbors to the north, St. Augustine and St. Johns County ARES® are working hard to advance D-STAR hardware/software and capability in the county with the purchase of D-STAR radios for their EOC. The new equipment will close the gap with capability in all EOCs from Duval (Jacksonville), through St. Johns, Flagler and down to Volusia county (Daytona Beach), enabling all of them to be part of a seamless network of D-STAR voice and data operations in the northern I-95 corridor. On Sunday night, the local ARES® D-STAR repeater was connected to the Southeastern D-STAR Weather Net. More than a half-dozen members checked into the net, joining a hundred others from 35 repeaters across eight states in the network. The net meets Sunday nights at 2100 local time, and EOCs are welcome to send representatives. The net also meets during severe weather call-ups. On Thursday, March 25 ARRL President Kay Craigie, N3KN, signed a new Memorandum of Understanding (MoU) with the American Red Cross (ARC) at ARC National Headquarters in Washington, DC. The MoU, which replaces an earlier Statement of Understanding that expired in 2007, provides a "broad framework for cooperation" between the ARRL and the ARC "in preparing for and responding to disaster relief situations at all levels in rendering assistance and service to victims of disaster, as well as other services for which cooperation may be mutually beneficial." Details here. The 2010 National Hurricane Conference was held March 29 - April 2 at the Orlando Hilton in Orlando, Florida. This conference is the nation's premier forum for education and professional training in order to improve hurricane preparedness, response, recovery and mitigation to save lives and property in the United States and the tropical islands of the Caribbean and Pacific. Hundreds of federal, state and local officials were there to learn, exchange ideas and recommend new policies to improve Emergency Management. 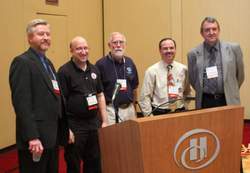 The National Hurricane Conference (NHC) Amateur Radio Committee requested and received two Amateur Radio sessions this year. The first session was held over the course of the entire afternoon on Tuesday and boasted attendance of more than one hundred. The forum, titled "Amateur Radio: Disaster Communications Before, During and After Hurricanes," required no entrance fee and was open to all hams. Center, WX4NHC, which is now entering its 30th year of service, and assisted the University of Miami Hospital (UMH) Project Medishare with operations at their field hospital in Port-au-Prince, Haiti in the wake of the recent earthquake. The WX4NHC Group coordinated and teamed up with MARS, the Maritime Mobile Net, the Intercontinental Net and the VoIP Hurricane Net to provide long distance HF communications between UMH Miami and Haiti. They also provided extensive interoperable local communications (VHF, UHF, Marine, MARS) among the UMH Field Hospital, USNS Comfort Hospital Ship, other Medical Missions, Airport Terminal, Medical Supplies Logistics support and critical patient transfers. Those in attendance also learned about the VoIP Hurricane Net, which uses Echolink and IRLP technology to provide surface reports to WX4NHC and provides interoperability and pathways into the affected area of hurricanes for EOCs and Non-Governmental Organizations (NGOs) at the local, regional and national level and also serves as a liaison with D-STAR nets when active. Hams in attendance were also provided an ARRL update. On Wednesday morning an Amateur Radio session designed for Emergency Management professionals titled "Amateur Radio: The Emergency Manager's Hidden Resource" was held. Macedo and Sarratt conducted this session for 40 emergency management officials of which half were Amateur Radio operators. Good questions and interchange occurred with the managers from all over the U.S. This rap session concept was started at last year's Hurricane Conference in Austin, Texas, where Dennis Dura, K2DCD and Sarratt found this concept worthwhile in exposing the ARRL's role at section, regional/division and national levels for Emergency Management and other served agencies. This interaction proved very valuable to emergency management and Amateur Radio. On Wednesday evening, the Orange County (Florida) EMA hosted a meeting for ARES® and all amateurs interested in emergency radio communications who were unable to attend the Hurricane Conference. Macedo and Sarratt gave a recap and answered emergency communication questions. Emergency Manager Keith Kotch and more than 35 attended the meeting, toured the EOC/911 operations center and wrapped up by enjoying a special and tasty Hurricane Katrina cake, baked by Linda Kotch. Jim Palmer, KB1KQW, a professional videographer and ARRL Eastern Massachusetts ARES® Assistant Section Emergency Coordinator, provided video and audio coverage for all three events. Videos will be available online by mid-June. Watch prior conferences from 2008 and 2009 here. Colorado State University's Research Scientist Philip J. Klotzbach and Professor Emeritus William M. Gray reported that information obtained through March 2010 indicates that the 2010 Atlantic hurricane season will have significantly more activity than the average 1950-2000 season: "We estimate that 2010 will have about eight hurricanes (average is 5.9), 15 named storms (average is 9.6), 75 named storm days (average is 49.1), 35 hurricane days (average is 24.5), four major (Category 3-4-5) hurricanes (average is 2.3) and ten major hurricane days (average is 5.0). The probability of U.S. major hurricane landfall is estimated to be about 130 percent of the long-period average. We expect Atlantic basin Net Tropical Cyclone (NTC) activity in 2010 to be approximately 160 percent of the long-term average. We have increased our seasonal forecast from the mid-point of our early December forecast." The Chinese Radio Sports Association (CRSA) has asked that the frequencies of 7050 KHz and 7060 kHz be kept clear for emergency communications following a devastating earthquake in Yu Shu district, Qinghai province. A number of radio amateurs are active in supporting the rescue and recovery efforts including BG9UA, BG9UP and BG9UO. The emergency communication team of the Anhui Amateur Radio Society, led by Mr. Du, BG6CEV, was flying to Qinghai on April15 to bring communication equipment. March 1 -- Kentucky has a new ARES Emergency Communications Plan as of March 1, 2010. The Kentucky Amateur Radio Emergency Service (KY ARES) is comprised of Kentucky operators who have voluntarily registered their capabilities and equipment for public service communications and disaster/emergency communications duty. The ARRL Kentucky Section consists of five regions, 13 districts and 120 counties. April 24 -- Sacramento Valley (CA) Emergency Communications Leadership Conference this Saturday. The third annual seminar for Emergency Communications Leadership in the ARRL Sacramento Valley (California) Section will take place Saturday, April 24, from 9 AM to 2 PM, at the U.C. Davis Sierra Foothills Research and Extension Center, 8279 Scott Forbes Rd., in Browns Valley. The seminar is hosted once again by Art Craigmill, K6ALC, the Yuba and Sutter County Emergency Coordinator. The seminar is organized and presented by Larry Sutter, WD6FXR, Section Emergency Coordinator. All Section emcomm leadership is invited as well as anyone who intends to step up to a leadership position. All emcomm organizations, not just those whose title includes the ARES label, are urged to attend. In February 2010, the American Hospital Association (AHA) filed a request with the FCC for a blanket waiver of Section 97.113(a)(3) of the Commission's Rules "to permit hospitals seeking accreditation to use Amateur Radio operators who are hospital employees to transmit communications on behalf of the hospital as part of emergency preparedness drills." On March 3, the FCC issued a Public Notice -- WP Docket 10-54 -- seeking comments if the Commission "should grant AHA's request for a blanket waiver of Section 97.113(a)(3) to permit amateur operators who are hospital employees to participate in emergency drills that are conducted by hospitals for accreditation purposes and that are not government-sponsored." Section 97.113(a)(3) specifically prohibits amateur stations from transmitting communications "in which the station licensee or control operator has a pecuniary interest, including communications on behalf of an employer." On April 2, the ARRL filed comments regarding the blanket waiver request. While not opposing the grant of a waiver, the ARRL urged the Commission "to carefully delineate limits on the types of communications that can be provided by employees of hospitals for accreditation purposes or otherwise pursuant thereto." The ARRL pointed out that AHA's waiver request was not "sufficiently specific to preclude any possible misunderstanding by Amateur Radio licensees (and hospital administrators) about what is permitted and what is not. The Commission's notice alleviates some, but not all of these concerns." *Accommodate the specific needs of AHA and its member hospitals. *Permit effective and seamless emergency and disaster relief communications preparedness drills and exercises incorporating Amateur Radio. *Protect the Amateur Service to some extent against potential commercial exploitation. *Protect Amateur Radio licensees who are employees of hospitals against pressure from employers to conduct inappropriate communications by means of Amateur Radio stations. Background and more discussion here. The Hospital Disaster Support Communications System (HDSCS) of Orange County, California, has filed its official comments to the FCC Public Notice regarding the "blanket waiver" request by the American Hospital Association. HDSCS is a specialized unit of ARES formally organized in 1980 at the request of hospitals in north Orange County who hold drills together each year for disaster preparedness. It came about as the result of a phone outage at a large hospital in Fullerton in 1979 and the impressive response of Amateur Radio operators to that emergency. Beginning with seven at inception, the list of HDSCS-supported facilities has grown to include all of the acute care receiving hospitals in the county, plus other critical medical facilities. [The National Communications System is a long-time MoU partner with the ARRL. The NCS is a unique organization. It is a confederation of 23 organizations across the Federal Government tasked with ensuring the availability of a viable national security and emergency preparedness telecommunications infrastructure. The President designates member organizations that own or lease telecommunications facilities/services of significant value to emergency response or that have important telecommunications policy, regulatory, or enforcement responsibilities. The assets of these 23 organizations comprise the bulk of the Federal Government's telecommunications resources. Veterans will recall the NCS "Night Tango" exercises of the '80s, designed to evaluate the capabilities of volunteer communications systems to support NCS goals. NCS recognizes the resources that trained radio amateurs bring to the table, especially through the decentralized field organization (ARES and NTS) of the ARRL. The SHARES program is charged with promoting interoperability between High Frequency radio systems used by the Federal departments and agencies. It is also tasked to foster interoperability through examination of regulatory, procedural, and technical issues. This role has taken on added importance with the widespread purchase and use of Automatic Link Establishment (ALE) technology throughout the HF radio community. In responding to this role, the NCS SHARES HF Interoperability Working Group has established the SHARES Action Item process to identify, record, and track issues affecting HF radio interoperability in the Federal government. Emphasis has also been placed on expanding awareness of new technologies in HF radio. Technological advancements have made HF radio more efficient and competitive in day-to-day operations. Multiple microprocessors, Digital-Signal Processing (DSP) and computer control, and Automatic Link Establishment (ALE), combine to simplify and enhance HF radio operation and frequency selection. The US Navy has successfully demonstrated e-mail links within a surface fleet Battle Group via HF radio, with transmission speeds of up to 4.8 kbps. Automatically combining HF radio and other communications media such as land line, satellite, and VHF/UHF enables a user to consider costs and priority in processing messages. This technology provides selective routing of high-speed, error-free transmission of fax, e-mail, text, and data files. Data compression techniques further enhance the effective data rate. New technologies also enable the transmission of imagery over HF. High-resolution color and monochrome images from analog cameras, still video cameras, and digital cameras as well as imagery from IR and RADAR sources can be processed via HF radio. Image compression and error correction algorithms are featured in this newly enhanced technology. The ARRL is pleased to welcome Emergency Preparedness and Response Manager Mike Corey, W5MPC, to the Headquarters staff in Newington. Corey's major responsibilities include addressing the development and implementation of an organizational disaster response plan as well as an operational continuity plan, complete with supporting procedures and training. Corey also will play an integral part in the management of ARES®, and in future negotiations with served agencies with whom ARRL shares or creates Memoranda of Understanding. An Extra class licensee and an ARRL Life Member, Corey comes to the ARRL with almost 20 years of experience with emergency communications. Licensed since 1988, he has been involved with SKYWARN since 1991 and has attended basic and advanced SKYWARN training. He is the author of the ARRL Storm Spotter's Handbook, which was released last month. After graduating from Indiana University, Corey embarked on a career in law enforcement, working as the Communications Officer for the Howard County Sheriff's Department, where he was responsible for dispatching law enforcement, emergency medical services, fire services and county resources to calls for service, as well as operating and maintaining the logs for the National Crime Information Center. Corey also served as Project Manager for contingency planning for public safety communications. While employed at the Sheriff's Department, he also volunteered at the Kokomo Howard County Emergency Management Agency, serving as a Special Deputy Sheriff, and assisted with emergency management response planning and local disaster response as part of the Emergency Operations Center staff. Corey left Indiana to pursue a Master's degree in Criminal Justice at the University of Mississippi. While attending to his studies, he joined the University of Mississippi Police Department as the Communications Officer. Corey served as the primary contact for the department, provided support training to new employees, coordinated public safety communications during campus events and advised the University administration on severe weather response. While part of the University Police Department, Corey became a Mississippi Certified Public Safety Communications Instructor. In re the item in the last issue on the Haitian medical relief effort, I would like to clarify a few issues. The article stated "HF Winlink was used for routine traffic. Its primary purpose was to provide backup for emergency traffic should the VSAT e-mail link go down. This was never needed but having the capability was a safety net that met the mission requirements." This is not the case. Initially, Nassau University, Miami Med, and the Southern Baptist Disaster Relief faced many hours when the only transport layer available was Winlink 2000. Much of this traffic was command and control, but some did provide information to save a few lives -- very gratifying. Secondly, MARS does NOT deploy its members. It is the MARS Agencies who deploy MARS volunteers. This was recently made clear with an "ALL_MARS" bulletin sent by the Chief of Army MARS. There is a huge Civil government, and non-government list of Agencies using the "AMARS Agency Use Agreement," which provides the instructions for the service. It gives these agencies the capability to train and use ANY volunteer necessary to accomplish their mission using the MARS services, including ARRL ARES® members, and MARS volunteers, IF they are qualified. Many agencies spend time and money training these volunteers as they would their own employees. Fact is, these agencies, especially Federal agencies, who must use their own employees, train these employees for this support. The third annual EmComm East emergency communications conference is slated for September 18, 2010, in Rochester, New York. EmComm East is an ARRL-sanctioned Amateur Radio emergency communications conference where operators can attend training sessions on technical topics, learn from served agencies, obtain VE testing for license upgrades, and interact with other emcomm operators from all over the area. A recurring theme of this newsletter is the work of excellence of our ARES® volunteers. But, it is also important that we recognize the work of the often unsung Emergency Manager as a supporter of our efforts. Flagler County's Emergency Management Chief Troy Harper falls into that category: He has been a staunch supporter of ARES® efforts in this county, for which we are very grateful. As a 20+ year resident of Flagler County, Harper has a vested interest in the community. He started his professional career in the United States Air Force and then returned to Flagler County where he was self-employed for many years. Harper states: "My Emergency Management career started with Flagler County in 1994 when I worked as a public information officer for Emergency Management. When I was hired as the Emergency Management Chief I committed to making Flagler County prepared for all hazards. From mitigation and preparedness through response and recovery, my goal is to keep the citizens and visitors of Flagler County informed and involved. I operate my office under the adage, "It wasn't raining when Noah built the ark." A tip of the ARRL fedora to Flagler Emergency Management Chief Troy Harper.